William Hackett finds himself in a system he doesn't understand. He's accused of a crime and the Russians want blood. His. Somehow this peaceful father killed a man in cold blood. A man about to launch a ground-breaking piece of technology. As political tensions rise, they will dance to a tune with the most sinister of crescendos. Read this book in three days, a record for me! This is an amazing story line that keeps you guessing throughout with lots of twists and turns.The characters are real and with lots of depths and have the chance to be really developed through future books. Well done and let's have another soon! ★★★★★ Don't miss out on this fast-paced espionage thriller!!! Once again Mr. Heath delivers a fantastic read in this fast paced espionage thriller on par with the likes of Frederick Forsyth and John le Carré. ★★★★★ A great thriller that keeps you guessing! I greatly enjoyed reading The Tablet! I found the story to be well crafted, with plenty of twists to keep me guessing. I could easily see it as a movie one day. Great characters, too. Overall it's a fast-paced novel perfect for fans of Bond or Bourne. Absolutely loved this third novel from Tim Heath. Having read The Last Prophet, the suspense level for what The Tablet is was magnified. Does it or doesn't it? Mix that in with a fast paced crime and spy thriller storyline and I was hooked and didn't want to put it down. Looking forward to seeing what happens in the next in the series. Get writing Tim! ★★★★★ Nicely paced, wonderful tension and twists. I received an advanced review copy of The Tablet and have to say I wasn't disappointed. Nicely paced, the tension ratchets wonderfully as the clock ticks to unearth the truth and save Bill, while international animosity escalates. The number of twists were set up and revealed well. All in all a great read. Tim's best yet! Great story with amazing twists. His best book! Very fast moving exciting adventure, couldn't put it down…the author keeps you gripped in the story until the last minute. Just finished this novel. It was very gripping. I could not put it down once started. 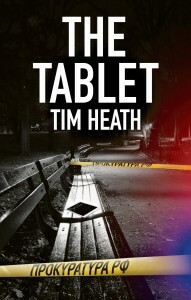 Another exciting book from Tim Heath. This story is full off unexpected twists and keeps you turning the page. Also, if you have visited St Petersburg, you will recognise the descriptions of the Summer Gardens, the canals, the FSB building, the traffic… Tim has lived in St P and he really conveys what the place is like. It makes the story even more plausible – could it really happen?! ★★★★★ Gripping, fast-paced, satisfying read. Excellent read. It was fast paced and gripping all the way through. I read it in 3 days as it was hard to put down. Great twists and turns to the story and well formed characters. A satisfying and enjoyable read. I liked that it was set in St. Petersburg, the author seemed to have a good grasp of the city and brought it to life. ★★★★★ Excellent read, didn't disappoint. The tablet is an excellent read. Easy enough to follow, with a well-developed story and enough suspense to keep you guessing. Because of the way they are presented, it's easy to think of faces and personas that might match the persons described. The characters and how they move through the story allow for the reader to shape their own images – which is something I really appreciate in a book. There was an instant connection with the protagonists, and the last pages left me eager to learn more about them. This is the second book I have read by this author (the other one was his debut, “Cherry Picking”). It's nice to see how the style develops, and how there is now much more story between the lines than in the first novel. I really enjoyed both books, and I look forward to reading the next one! Very interesting read. Could not put it down. Easy to follow and like an old fashion Agatha Christie mystery. A good murder story, well written and composed. It flowed really well and had believable characters, especially Anya, and I found it to be a real page-turner. The plot moved along, leaving me guessing who really did it and how, and really missed the obvious since I got so engrossed. Well worth reading and you won't be disappointed. Keep up the good work Tim! I chose this rating because it was a good book from start to finish. Very intriguing plot, good story line. Main characters gelled together very well , hope there's a sequel.